Exercise researcher Mike Joyner's latest quest started with llamas and bar-headed geese. It may end up revising a basic principle of medicine and addressing unmet needs for patients with diseases such as asthma or COPD. Michael Joyner, M.D., has a cold. But it doesn't decrease his obvious excitement for a project that really started over two decades ago. And like everything he's studied since his undergraduate days, it has to do with oxygen. "One of the things that has bothered me for about the last 20 or 25 years is that birds [bar-headed geese] flying over Mount Everest have left-shifted hemoglobin," he says. "It's literally the first thing they teach you in medical school," says Dr. Joyner. But that doesn't square with the left-shifted geese. They fly at altitudes over 20,000 feet through high mountain passes where oxygen is scarce. So, Dr. Joyner wondered, why wouldn't the geese be right-shifted to maximize what little oxygen was present? When he started to look further, the oddities increased. "And it turns out llamas are left-shifted, as are a bunch of other animals that live at very high altitudes," says Dr. Joyner. "This bothered me for a while and I started wondering, okay, why would evolution pick a different solution than the biochemistry textbooks tell us is correct?" 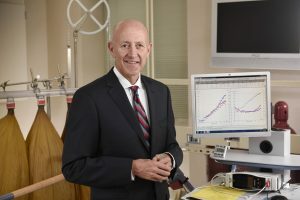 He recently received the National Heart Lung and Blood Institute's Outstanding Investigator Award to study this question. The award provides support for, "projects of unusual potential," by providing more money than a typical grant for a longer period of time. The goal is to give researchers more time and flexibility to pursue a risky scientific question that could pay off big. "Left-shifted people sometimes have a high blood count," explains Dr. Joyner. "It's sort of an incidental finding and it’s a very small fraction of the population." Prior to getting the award, Dr. Joyner pulled in colleagues and scoured medical journals. Ultimately, they found a large family to take part, and they began to determine how they might find answers. Fortunately, Mayo has a specialized area for studying just these kinds of complex questions, says Dr. Joyner. Called the Clinical Research and Trials Unit, this area provides expertly trained staff and tools that allow researchers to collect a range of data. 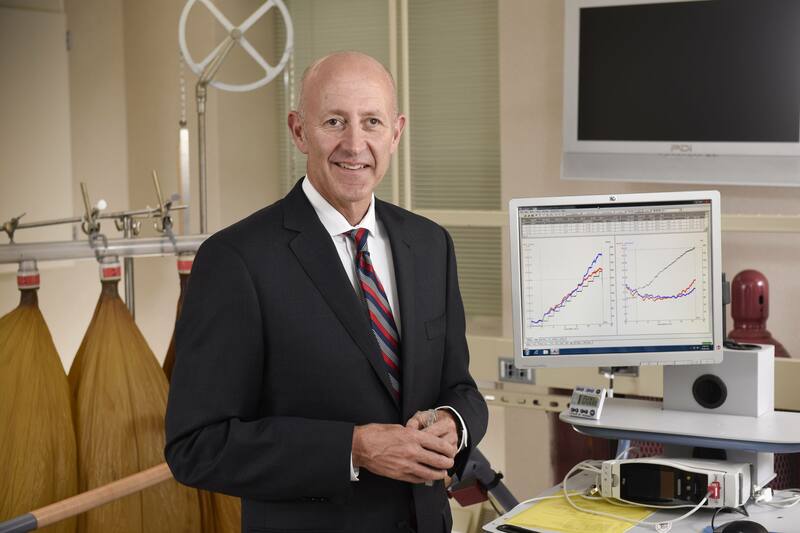 It is part of Mayo Clinic's Center for Clinical and Translational Science, says Dr. Joyner, explaining that the CRTU allows researchers to undertake detailed studies of key aspects of physiology. "We are one of the few institutions left that have something like the CRTU," says Dr. Joyner. "We have developed capabilities where we can measure how air gets into the lungs; how it gets across the lungs into circulation, how much blood the heart actually pumps, how much blood goes to each organ and how each organ is using that blood." "We can also start to understand the other adaptations these people have made and start thinking about how we can intervene in patients with disorders," says Dr. Joyner. For example, he says, in people who have trouble oxygenating their blood due to lung disease or an acute lung injury, might a drug that left-shifted hemoglobin help their lungs pick up more oxygen, provided it can be off-loaded at the tissue level? Or on the other hand, for people without sufficient blood flow, a right-shift might help. "I'm attempting to keep pushing the envelope a bit," says Dr. Joyner. "And hopefully we’ll make some discoveries about oxygen transport in humans that will be of general interest to the whole field and that may provide insights into patient care." This is quite an accomplishment please I hope that Doctor Joyner may continue his research. Their are many people that have respiratory illnesses. This may even help people with pulmonary hypertension , COPD, and other breathing problems.